The Mailchimp integration allows you to create an email list from your form submissions and monitor engagement within all of your lists. Note, to use this integration you first need to have a Mailchimp account. Navigate to the ‘Integrations’ section in the left-side panel and click on the ‘Mailchimp’ app. Click ‘Connect’ in the right-side panel. You will be directed to log in with your existing credentials and asked to give Blitzen permission to access the app. Don’t worry, we won’t mess with the stuff that’s already there! If, for any reason, you would like to disable this app, just move the slider to ‘Off’ or disconnect it all together (How to Disconnect App). Navigate to the ‘Workflow’ section in the left-side panel and create a new workflow (How to Create Workflow). You can also edit an existing workflow. Drag the Mailchimp App over into your workflow. This is called an output. Configure the app by clicking the ‘+’ icon. From here you will see a number of options. The default setting is to sync all submissions from the input form or survey. If that is not what you wish to do simply add filters. Click ‘Add custom filter’ and use the three fields to create a segment. You are able to create any number of filters, just make sure they do not contradict each other. To delete a filter simply click on the ‘x’ icon in the right corner. You will then be asked to choose the destination your files will sync to. 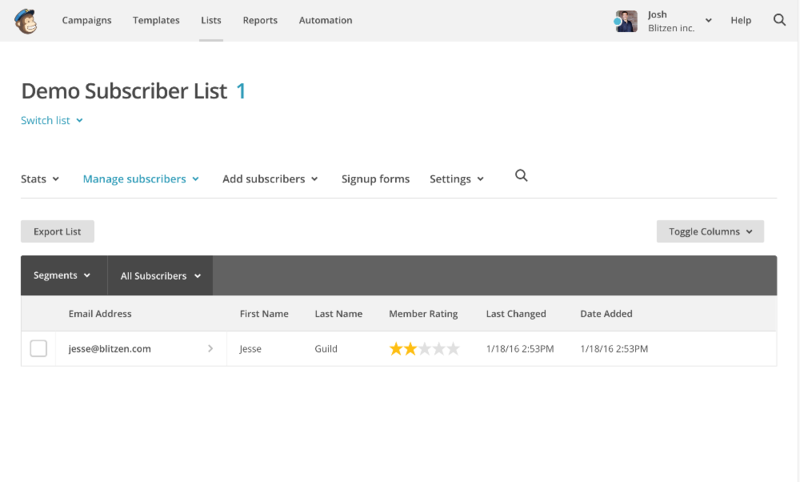 First you will need to choose whose credentials to use and the list you want to subscribe your users to. Then you will use the dropdowns to map the 'Email', 'First Name', and 'Last Name' fields. There is also an option to include the 'Double opt-in email'. This is there to make sure your email communications stay within the confines of the current Anti-Spam Law. Pushing data to Mailchimp is only one part of the integration. Check out this article to see how you can monitor list engagement.